Calling bonfield a guitarist is like calling michelangelo a painter. Legacy, Bonfield's fifth solo CD and second all solo-guitar album, is a retrospective collection of some of his finest compositions. Recorded on Alan Carruth's custom baritone and harp guitars, it's an incredibly rich and diverse collection of music. The tonality is amazing. Recorded live in the studio by Tom Eaton, this is a true audiophile recording capturing Bonfield's finest recordings at the height of the guitarists career. 1. Renaissance: An upbeat folk tune performed on long-scale baritone. 2. Angela's Ashes: A moody piece inspired by Frank McCourt's Pulitzer prize winning memoirs of the same name. 3. Centerline: Inspired by a scene from the movie Pulp Fiction-highly textured, and performed on Harp Guitar. 4. Mirage: A rhythmic dance through the dunes of an Egyptian desert. 5. The Passing: Originally composed for a dying mother many years ago, this is one of Bonfield's most heart-tugging compositions; performed this time for those lost in the Newtown, CT massacre. 6. Nightfall: Bonfield's favorite time of the day is the 'gloaming' hour-that time between night and day that is somehow filled with magic, promise, and occasionally doubt. 7. The Water is Wide: This traditional piece finds rare depth and angst while performed on Bonfield's short-scale baritone. 8. Homage: This up-tempo romp is dedicated to one of Bonfield's first fingerstyle heroes, Leo Kottke. 9. Summer Rain: Bonfield's masterpiece, originally included in his debut CD, Mystic Morning has grown substantially over the past 20 years. Just listen to the thunder of those sub-bass strings from the Harp Guitar! 10. Longing for the Day: a prayer for peace, a prayer for love, and a prayer of hope. 11. Wismean's View: Bonfield's song of a hawk soaring over a canopy of trees may be one of his strongest melodies. 12. The Name of the Wind: Another piece inspired by literature. This time it's the writing of Patrick Rothfuss and his Kingkiller Chronicles: The Name of the Wind and Wise Man's Fear. License Calling bonfield a guitarist is like calling michelangelo a painter by Ken Bonfield for your project. 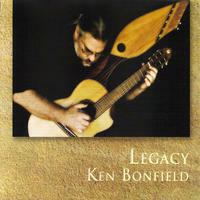 Play the music of Ken Bonfield in your restaurant or store. 12 String by Jeff Wahl: acoustic new age and jazz guitar.